Everyone pretty much knows brunch is a way of life for me. I live for a good Sunday Funday turn up. When I saw my good friend Kim Thomas post on Facebook that she wanted eggs Benedict but didn’t want to cook, I jumped at the opportunity to hang with my buddy and get eggs. I absolutely love Rizzo’s and chef/owner Michael Patrick is by far the coolest and nicest guy in Memphis. This is not up for debate. Rizzo’s is probably my favorite local spot. Kim and I headed to South Main to get some eggs! Oh yeah Rizzo’s has multiple Eggs Benedict options. I had the blackened catfish Benedict and Kim had the pork tenderloin Benedict. Yes, I didn’t have poached eggs. They just aren’t my thing. Rizzo’s also have a crab cake, filet mignon, and a vegetarian Benedict. We also got an order of Lobster Pronto pups and Chef Michael sent us out a lamb tenderloin and avocado dish to try. The lobster Pronto pups weren’t even on the menu for the day, but he made them for us anyways. The lamb was also amazing. See! I told you he was the nicest person in Memphis! We washed it all down with some some $4 mimosas and lots of laughs. 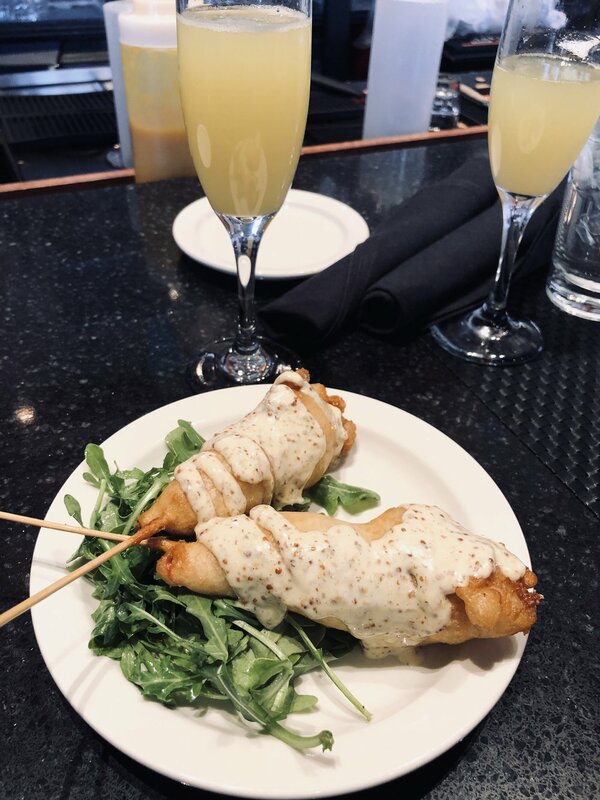 You have to do yourself a favor and try out Rizzo’s for brunch. You won’t be disappointed! Rizzo’s will be closing temporarily for renovations, but you can check out the pop up shop in the meantime in 409 S Main. Go check it out!